Valet Parking Fees: First 2 hrs - $12; each add'l hr - $4; daily max. - $33. Note: Valet hourly rates apply to first 24 hrs only. Add'l days or partial days $33 flat rate per day.
."1,2,3 Park" - Automated Entry/Exit System -only available at Detroit Metro Airport Parking facilities - a new breakthrough in airport parking technology, 1,2,3 Parknow makes on-airport parking even quicker and more convenient than ever before. The system is completely secure. Simply (a) ENTER by inserting your credit/debit card into the card reader at the lot entrance; PARK, no ticket needed; and EXIT by inserting the same credit/debit card when you leave the parking facility. The 1,2,3 Park system computes your charges based upon your length of stay, charges your card, prints a receipt, and you're on your way. 1,2,3 Park is now available at Metro Airport's Yellow and Green Lots, Blue Deck and Short-Term parking areas, and McNamara Terminal Parking Garage. Disabled Parking - For your convenience, there are reserved parking spaces for travelers with disabilities on every level of the parking structures and in the short term parking lots closest to the terminals. To park in these reserved spaces, official license plates bearing the disabled designation or other official documents issued by a municipality or state of residence must be prominently displayed. 1. McNamara Terminal Parking - parking garage with 11,500 spaces. Long-term, Short-term, and Valet Parking available. Commercial ground transportation services (taxis, shuttles for hotels, rental cars, etc.) are located in the Ground Transportation Center on Level 4 of the parking garage. Luggage check-in service and E-Ticket kiosks are located on level 6 of the parking garage. A fully-enclosed pedestrian bridge connecting the garage and the terminal is located on level 6 of the parking garage. 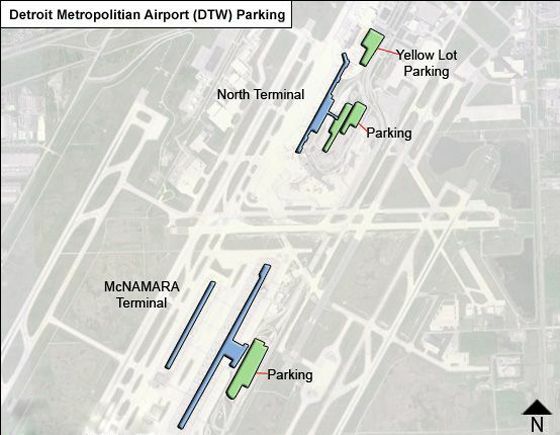 For up-to-the-minute information on parking at the McNamara Terminal, please call (800) 642-1978 . 2. North Terminal Parking - with nearly 6,500 parking spaces. Long-term parking available in the Big Blue Deck, and Yellow Lot. Short-term parking is also available in the Big Blue Deck located across the street from the North Terminal. For up-to-the-minute information on parking at the North Terminal, call (800) 642-1978. Free shuttle service from all of the airport's parking facilities.